Steenbras dam is closed to the public. Looking for an alternate venue try Theewaterskloof Dam at Villiersdorp. When travelling along the N2 away from Cape Town one has to cross the Hottentots Holland Mountains via Sir Lowry's Pass. As one goes over the top and starts to descend into the Grabouw valley on the other side the first sight one sees is the Steenbras dam. It spreads out across the valley on both sides of the N2. In recent years the dam has become more visible from the road as many of the pine trees that grew along the mountain slopes have been removed as they have been declared aliens. The dam in fact is split into two sections, the upper and lower dams. One crosses a bridge over the dams on the way to Grabouw. 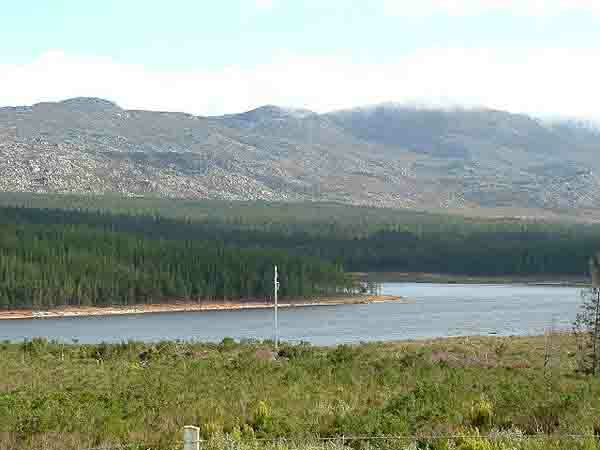 Steenbras is one of Cape Town's main storage dams and has its catchment area in the mountainous areas of Grabouw and Elgin. The dam was built in 1921 and covers an area of 380ha. There are two ways to reach the dam, the first being a turnoff near the top of Sir Lowry's Pass and the other along the coastal road from Gordons bay. A four kilometre drive up a winding road to the filtration plant gives one spectacular views over Gordon's Bay and False Bay. A visit to the dam on a warm summers day can be very pleasant. The dam is surrounded by about 1200 hectares of pine forests which are lovely to walk through. Once a year the dam is stocked with trout so if you are an avid trout fisherman with a permit to fish you can try your luck in the dam. Where there is water there are normally waterbirds. Steenbras is no exception. The shores of the upper dam have been inhabited by hundreds of Egyptian geese who nest there and on the small islands in the dam. Closer to Grabouw above the Steenbras dam is the Palmiet Pumped Storage Scheme. It was built in 1983 and is part of a water transfer scheme. To generate power water is released from the upper Rockview Dam to the two reversible pump turbines located 60 metres below ground level. After flowing through the turbines the water is discharged into the lower Kogelberg dam. When Cape Town's water reserves become low water can be pumped from the Palmiet River via the Rockview Dam to the Steenbras Dam to supplement the Cape Town water supply. The turbines at Palmiet have two functions. In the first instance they are used as conventional hydro turbines in the generating of power. When not generating to meet the morning and evening peaks on the system, they are used to regulate the voltage. The second use of the turbines is to reverse their direction to pump the water from the Kogelberg Dam back to the Rocklands dam. In the pump mode the generator becomes a huge motor which absorbs electricity from the network in order to drive the turbine in the pump direction. South Africa, has two pumped storage schemes, both operated in conjunction with the Department of Water Affairs and Forestry as part of water transfer schemes. The second station is situated in the Drakensberg in Kwa Zulu Natal and pumps water from the Kilburn Dam to the Sterkfontein Dam from where it flows into the Vaal River to augment water supply to Gauteng. Next time you visit Cape Town take a drive out along the N2 over Sir Lowry's pass and see the beauty of this part of our lovely country.